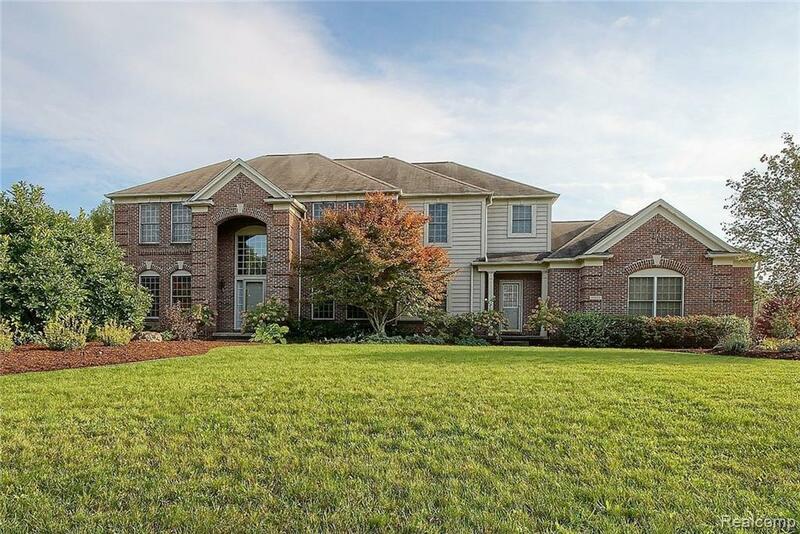 BEAUTIFUL COUNTRY CLUB VILLAGE COLONIAL! Situated on a private lot backing to the woods, this home offers 4 bedrooms, 3.2 bathrooms and 3,856 square feet. An impressive two-story foyer welcomes you with elegant details such as a circular staircase and wainscoting that continues into the formal dining room with a trey ceiling and crown molding. The spacious kitchen features hardwood floors, Cherry wood cabinets, Corian counter tops and double ovens. A dual fireplace in the breakfast nook is shared with the two-story great room. First floor laundry room and a study with a bay window. A large master suite boasts a trey ceiling and sitting area, his and hers walk-in closets and a private bath with dual sinks and a Jacuzzi tub. Princess suite with private bath and two additional bedrooms separated by a Jack & Jill bath. Crown molding, wainscoting and updated light fixtures throughout. Three car attached garage. Daylight lower level plumbed for additional bath.